D & A Instruments (now part of Campbell Scientific) assisted the USDA National Sedimentation Laboratory (NSL) by providing OBS-3 Turbidity Monitors and technical support for a study of sediment production from tilled agricultural lands in southeastern America. 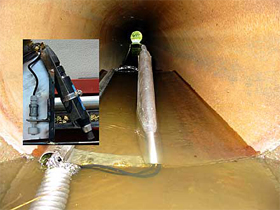 NSL scientists developed a special mount for installing the OBS® monitors in drain pipes so SSC (suspended sediment concentration), water, and sediment discharge could be simultaneously measured. The NSL study is providing insight into the processes that transport fine sediment from fields where it is a precious resource to streams and rivers where it can be a costly nuisance and violation of water-quality standards.